On the crisis in Greece and Syriza's failure to resist the eurozone. An anti-austerity rally in Greece. The Greek crisis has provoked a predictable mixture of indignation and self-satisfaction in Europe, alternatively lamenting the harshness of the settlement imposed on Athens or celebrating the last-minute retention of Greece within the European family, or both at once. Each is as futile as the other. A realistic analysis has no place for either. That Germany is once again the hegemonic power in the continent is no news in 2015: it has been clear for at least twenty years. Nor is the reduction of France to its handmaid, in a relationship not unlike that of Britain to the United States, a political novelty: since de Gaulle, the reflexes of the French political class have reverted to those of the early forties, not only in accommodation, but admiration for the superior power of the day, first Washington and then Berlin. Least of all is there any surprise in the outcome to date of monetary union. From the start, the economic benefits of European integration — taken for granted by bien-pensant opinion across the board — were very modest. In 2008 the most careful estimate, from two economists favorable to integration, Barry Eichengreen and Andrea Boltho, concluded that it may have increased the GDP of the Common Market by 3–4 percent from the late fifties to the mid-seventies; that the impact of the European Monetary System was nugatory; that the Single European Act may have added another 1 percent; and that monetary union had scarcely any discernible effect on either rate of growth or level of output. That was before the global financial crisis struck Europe. Since then, notoriously, the straightjacket of the single currency has been as disastrous for the Mediterranean South of the European Union (EU), as it has been advantageous for Germany, where wage repression — masking very low productivity growth — has given German industry a competitive whip-hand across the EU. As for growth rates, a glance at the economic performance of Britain or Sweden since Maastricht is enough to show how empty is the claim that the euro has been a particular blessing to any country other than its principal architect. Such is the reality of the “European family” as constructed by monetary union and the Stability Pact. Its ideology is unaffected. In official and intellectual discourse, the EU assures the peace and prosperity of the continent, banishing the specter of conflict between its nations, defending the values of democracy and human rights, and upholding the principles of a temperate free market, on which every other freedom is ultimately based. Its rules, albeit firm, are flexible; its motives join solidarity with efficiency. For the sensibility formed by this ideology — shared by the entire European political establishment, and the overwhelming majority of commentators and journalists — the sufferings of Greece have been painful to observe. But in the end good sense has prevailed, a compromise has been reached, and all must share the hope that no irreparable damage has been done to the EU. Since the electoral victory of Syriza in January the course taken by the crisis in Greece has also been predictable, if with a final twist that could not be foreseen. The origins of the crisis lay in a combination of the fraud perpetrated by Pasok under Konstantinos Simitis to qualify for entry into the eurozone, and the impact of the global crash of 2008 on the weak — debt-laden and uncompetitive — Greek economy. Since 2010 successive austerity packages — what were once called “stabilization plans” — were inflicted on Greece, dictated by Germany and France, whose banks were most at risk from a Greek default, but implemented by the troika of the European Commission, the European Central Bank, and the International Monetary Fund, superintending them on the spot. Five years of mass unemployment and welfare cuts later, Greek debt had merely soared still higher. Syriza won office because it promised, with much fiery rhetoric, to put an end to the submission of Greece to the rule of the troika. It would “renegotiate” the terms of the country’s wardship in Europe. How did it hope to do so? Simply by pleading for kinder treatment, and cursing when it was not forthcoming — pleas and curses alike appealing to the loftier values of Europe, to which the European Council could surely not remain deaf. Incompatible with these outpourings, mingling supplication and imprecation, was, all too plainly from the start, any thought of desisting from the euro. There were two reasons for that. Provincial in outlook, the Syriza leadership found it difficult to make any mental distinction between membership of the EU and of the eurozone, treating exit from the one as if it were virtual expulsion from the other: the ultimate nightmare for any good European, as they held themselves to be. They were also conscious of the fact that Greek standards of living — lubricated by low interest rates brought on by the convergence of spreads across Europe; topped up with Structural Funds — had indeed increased in the Potemkin years of Simitis, leaving warm popular memories of the euro, which did not connect subsequent miseries with it. Syriza made no attempt to explain the connection. Tspiras and his colleagues assured all who could listen that, on the contrary, there could be no question of abandoning the euro. With this, they gave up any serious hope of bargaining with the real — not their dreamland — Europe. By 2015, the threat of a Grexit was economically much weaker than it would have been in 2010, because by now the German and French banks had been paid off with the bailout nominally going to Greece. Despite residual alarmist talk elsewhere, the German finance ministry has for some time, and with good reason, dismissed any dramatic material consequences from a Greek default. But for the European ideology, to which all eurozone governments subscribe, the symbolic blow to the single currency — indeed, in the typical language of the day, the “European project” itself — would be grievous, a setback it was felt critical to avoid. Had Syriza put in place, as soon as it was elected, contingency plans for a managed default — preparing the capital controls, alternative currency issue, and other transitional measures that would need to be imposed overnight, if disorder was not to ensue — and threatened the EU with one, it would have had a bargaining weapon in its hand. Had it also made clear that in event of a showdown, it could pull Greece out of NATO, even Berlin would have thought twice about a third austerity package, in the face of American fright at any such prospect. But for the Candides of Syriza, that was naturally even more taboo than thought of a Grexit. So, confronted with a petitioner alternatively beseeching and abusing them, without a card in its hand, why should the assembled European powers have made any concessions, knowing in advance that whatever they decided would be accepted? By their lights, they behaved quite rationally. The one twist in a chronicle otherwise so patently foretold came when Greek Prime Minister Alexis Tsipras, in desperation, called a referendum on the third memorandum presented to the country, and the Greek electorate by a large majority rejected it. Armed with this resounding “no,” Tsipras came back from Brussels, having uttered a hangdog “yes” to a fourth and even harsher memorandum, claiming he had no alternative because the Greeks were attached to the euro. In that case, why not have asked the question of them in the referendum — will you accept anything, provided you keep the euro? In calling for a resolute “no,” and within little more than a week demanding a submissive “yes,” Syriza has turned its coat with a speed not seen since war credits were supported by European social democracy in 1914, even if this time a minority of the party has saved its honor. In the short run, Tsipras will no doubt flourish on the ruins of his promises, as — the most obvious foreign comparison — the Labour Party leader Ramsay Macdonald once did in Britain, heading a national government composed of Conservatives and imposing austerity in the Depression, before being buried in the contempt of his contemporaries and of posterity. Greece has had its share of figures like this. Few have forgotten Stefanos Stefanopoulos of the Apostasia of 1965. The country, no doubt, will have to live with another such. What of the larger logic of the crisis? As all opinion polls show, attachment to the EU has declined steeply over the past decade, everywhere and for good reason. It is now widely seen for what it has become: an oligarchic structure, riddled with corruption, built on a denial of any sort of popular sovereignty, enforcing a bitter economic regime of privilege for the few and duress for the many. But that does not mean it faces any mortal danger from below. Anger is growing in the population. But fear still greatly outweighs it. In conditions of increasing insecurity, but short of catastrophe, the first instinct will always be to cling to what exists, however repellent, rather than to risk what might be radically different. That will change only if, and when, anger is greater than fear. For the moment, those who live on fear — the political class Tsipras and his colleagues now join — are safe. Perry Anderson is on the editorial board of New Left Review . 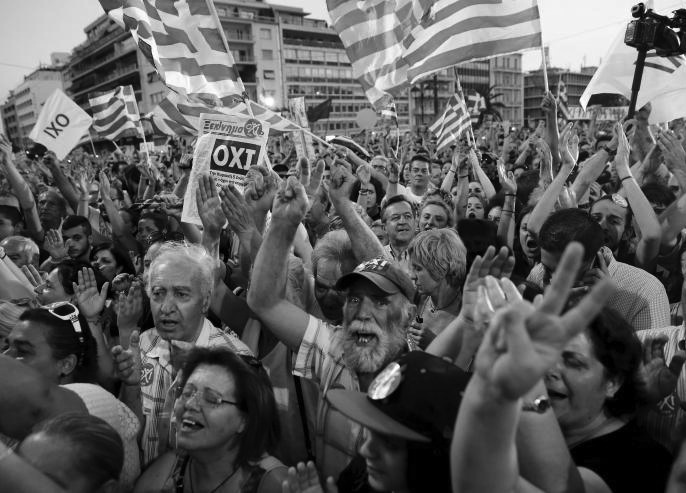 On the crisis in Greece and Syriza’s failure to resist the eurozone.